#TBT We are throwing back to the 1950’s today with a photograph of Hugh Morson High School. The high school was located at the intersection of New Bern Avenue and Person Street in Raleigh. It served as a high school from 1925 until 1955, and then became a junior high school. 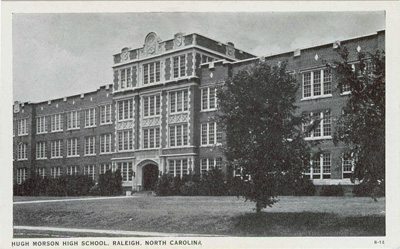 At the time that the school graduated its last high school class in 1955, the city of Raleigh had a population of 55,000, as compared to over 400,000 today. The school was demolished in 1965 to make way for the United States Courthouse. Happy Thursday!